“Greece has turned a page. Greece is leaving behind the destructive austerity, fear and authoritarianism. It is leaving behind five years of humiliation and pain.” says the new leader, a former communist, Alexis Tsipras, who leads the coalition left leaning groups as Syriza. The big question, could the "unthinkable", that idea of a complete default and exit from the Eurozone be the outcome of this populist democratic revolution? Think back, way back, imagine Greece, ancient Greece, to the start of one of the greatest civilizations known to history. Solon, the great hero poet, when Greece had sunk into unbearable economic crisis due to debt laws that had become unbearable to the vast majority, was asked by the people, to come back and set things right again. Solon ripped up the debt, established fair laws, and ushered in the great idea of democracy that we worship in theory but not practice today. Who are these "elites" who don't like the result? Why don't they like it? When the people speak, the "elite" will say that the people have made a mistake due to ignorance. Elites will no doubt work hard to make that thought appear to be true. And so, the conflict continues. What is the truth? So, what is the background? What are the root causes of this transformational situation? "The Greek debt crisis that erupted in 2010 is back and again threatens the stability of the Eurozone. That crisis was the result of two factors. First, an unbridled spending drift of both the private and the public sectors in Greece during the boom years of 2000-2010, which led to unsustainable levels of debt. Second, reckless lending to Greece by Northern Eurozone banks. At no time the Northern bankers asked themselves the question of whether the Greeks would repay the loans." 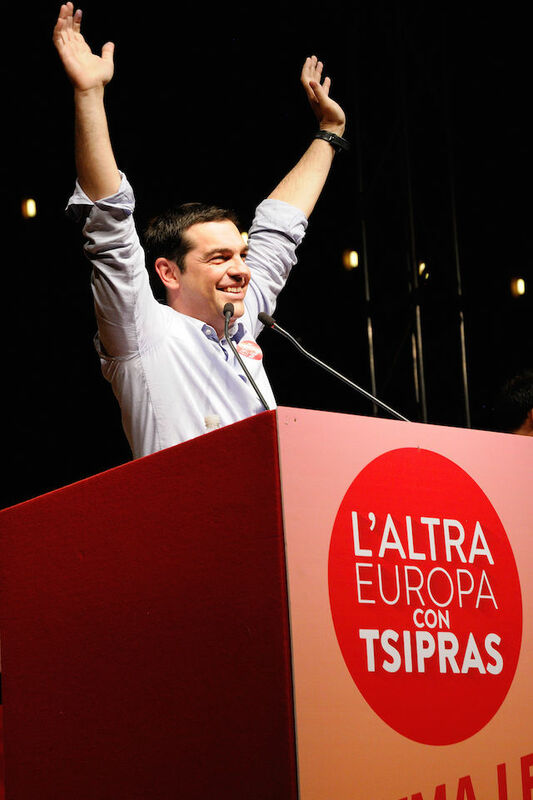 says Paul De Grauwe in his article The Greek Election 2015 – Revolt Of The Debtors. The similarities to the bank bailout offered as the solution to the financial crisis experienced by the United States rings familiar. Save the banks while abandoning the millions of home owners. In Greece, it was save the European banks, while abadoning the people of Greece. We can't be surprised when mainstream media presents the issues in simple moral terms that simply don't address the real root causes. "This narrative, however, loses sight of the political upheavals triggered by the human misery that results from intense austerity. The millions of people who are pushed into misery by the creditors from the North of Europe are not passive subjects. They not only protest in the streets, something the creditors can easily live with. They also vote for those political parties that promise them that there is a better way to deal with the problem. And these are the parties that are out to break the established political and social order." continues De Grauwe in his article published before the historic election. We have a choice, every day, to organize, to work together, in our communities in order to create a social order that provides justice we the citizens, rather than the private tyrannies, banks and multi-national corportations. Alexis Tsipras3" by Lorenzo Gaudenzi - Own work. Licensed under CC BY-SA 3.0 via Wikimedia Commons.
? Write-off the greater part of public debt’s nominal value so that it becomes sustainable in the context of a «European Debt Conference». It happened for Germany in 1953. It can also happen for the South of Europe and Greece.
? Include a «growth clause» in the repayment of the remaining part so that it is growth-financed and not budget-financed.
? Include a significant grace period («moratorium») in debt servicing to save funds for growth.
? Exclude public investment from the restrictions of the Stability and Growth Pact.
? A «European New Deal» of public investment financed by the European Investment Bank.
? Quantitative easing by the European Central Bank with direct purchases of sovereign bonds.
? Finally, we declare once again that the issue of the Nazi Occupation forced loan from the Bank of Greece is open for us. Our partners know it. It will become the country’s official position from our first days in power. On the basis of this plan, we will fight and secure a socially viable solution to Greece’s debt problem so that our country is able to pay off the remaining debt from the creation of new wealth and not from primary surpluses, which deprive society of income.
? Immediately increasing public investment by at least €4 billion.
? Gradually reversing all the Memorandum injustices.
? Gradually restoring salaries and pensions so as to increase consumption and demand.
? Providing small and medium-sized enterprises with incentives for employment, and subsidizing the energy cost of industry in exchange for an employment and environmental clause.
? Investing in knowledge, research, and new technology in order to have young scientists, who have been massively emigrating over the last years, back home.
? Rebuilding the welfare state, restoring the rule of law and creating a meritocratic state. We are ready to negotiate and we are working towards building the broadest possible alliances in Europe. The present Samaras government is once again ready to accept the decisions of the creditors. The only alliance which it cares to build is with the German government. European negotiation by a SYRIZA government, or acceptance of the creditors’ terms on Greece by the Samaras government. What will happen though until the negotiation is over? With SYRIZA for a National Reconstruction Plan for the Greek society. We assume responsibility and are accordingly committed to the Greek people for a National Reconstruction Plan that will replace the Memorandum as early as our first days in power, before and regardless of the negotiation outcome. The National Reconstruction Plan focuses on four major pillars to reverse the social and economic disintegration, to reconstruct the economy and exit from the crisis. Our program to immediately confront the humanitarian crisis, with an estimated cost around €2 billion, amounts to a comprehensive grid of emergency interventions, so as to raise a shield of protection for the most vulnerable social strata.
? Free electricity to 300.000 households currently under the poverty line up to 300 kWh per month per family; that is, 3.600 kWh per year. Total cost: €59,4 million.
? Programme of meal subsidies to 300.000 families without income. The implementation will take place via a public agency of coordination, in cooperation with the local authorities, the Church and solidarity organizations. Total cost: €756 million.
? Programme of housing guarantee. The target is the provision of initially 30.000 apartments (30, 50, and 70 m²), by subsidizing rent at €3 per m². Total cost: €54 million.
? Restitution of the Christmas bonus, as 13th pension, to 1.262.920 pensioners with a pension up to €700. Total cost: €543,06 million.
? Free medical and pharmaceutical care for the uninsured unemployed. Total cost: €350 million.
? Special public transport card for the long-term unemployed and those who are under the poverty line. Total cost: €120 million.
? Repeal of the leveling of the special consumption tax on heating and automotive diesel. Bringing the starting price of heating fuel for households back to €0,90 per lt, instead of the current €1,20 per lt. Benefit is expected. The second pillar is centered on measures to restart the economy. Priority is given to alleviating tax suppression on the real economy, relieving citizens of financial burdens, injecting liquidity and enhancing demand. Excessive taxation on the middle class as well as on those who do not tax-evade has entrapped a great part of citizens in a situation which directly threatens their employment status, their private property, no matter how small, and even their physical existence, as proved by the unprecedented number in suicides.
? Settlement of financial obligations to the state and social security funds in 84 installments. 1. The immediate cease of prosecution as well as of confiscation of bank accounts, primary residence, salaries, etc, and the issuance of tax clearance certificate to all those included in the settlement process. 2. A twelve-month suspension of prosecution and enforcement measures against debtors with an established zero income, included in the settlement process. 3. Repeal of the anti-constitutional treatment of outstanding financial obligations to the state as offence in the act (in flagrante delicto). 4. Abolition of the mandatory 50% down payment of the outstanding debt as a prerequisite to seek a court hearing. The down payment will be decided by a judge. It will be around 10%-20%, according to the financial circumstances of the debtor.
? Immediate abolition of the current unified property tax (ENFIA). Introduction of a tax on large property. Immediate downward adjustment of property zone rates per m². That tax will be progressive with a high tax-free threshold. With the exception of luxurious homes, it will not apply on primary residence. In addition, it will not concern small and medium property.
? Restitution of the €12000 annual income tax threshold. Increase in the number of tax brackets to ensure progressive taxation.
? Personal debt relief by restructuring non-performing loans («red loans») by individuals and enterprises. total servicing to banks, the state, and the social security funds does not exceed ? of a debtor’s income.
? We are setting up a public intermediary organization for the handling of private debt, not as a «bad bank», but both as manager of any payment overdue to the banks and as bank controller regarding the implementation of the agreed-upon settlements.
? In the next days, SYRIZA will table a law proposal to extend ad infinitum the suspension of foreclosures on primary residences, valued less than €300000.
? The law proposal will also include the prohibition to sell or transfer the rights over loans and over land charges to secure the loans to non-bank financial institutions or companies. Starting capital at €1 billion.
? Restoration of the minimum wage to €751. A net increase in jobs by 300000 in all sectors of the economy – private, public, social – is expected to be the effect of our two-year plan to regain employment. Such a plan is indispensable for absorbing the long-term unemployed, particularly those over 55 years, as well as the young unemployed, who would be largely bypassed by economic growth. Our plan would save funds to expand unemployment insurance to more beneficiaries.
? Restitution of the institutional framework to protect employment rights that was demolished by the Memoranda governments.
? Restitution of the so-called «after-effect» of collective agreements; of the collective agreements themselves as well as of arbitration.
? Abolition of all regulations allowing for massive and unjustifiable layoffs as well as for renting employees. Employment programme for 300000 new jobs. From the first year of SYRIZA government, we set in motion the process for the institutional and democratic reconstruction of the state. We empower the institutions of representative democracy and we introduce new institutions of direct democracy. Regional organization of the state. Enhancement of transparency, of the economic autonomy and the effective operation of municipalities and regions. We empower the institutions of direct democracy and introduce new ones. Empowerment of citizens’ democratic participation. Introduction of new institutions, such as people’s legislative initiative, people’s veto and people’s initiative to call a referendum. Empowerment of the Parliament, curtailment of parliamentary immunity, and repeal of the peculiar legal regime of MPs’ non-prosecution. Regulation of the radio/television landscape by observing all legal preconditions and adhering to strict financial, tax, and social-security criteria. Re-establishment of ERT (Public Radio and Television) on a zero basis. Estimating the cost of the non-negotiable plan of immediate measures to restructure society. We have calculated the total cost of the immediate programme for confronting the humanitarian crisis as well as the fiscal cost of abolishing monstrous tax measures. 1. First of all, from the measures and procedures of settlement and clearance. We plan to collect, at a minimum, €20 billion out of a total of €68 billion in arrears over a seven-year period. That would add approximately €3 billion into the public coffers in the first year. 2. Secondly, by decisively combatting tax evasion and smuggling (e.g. fuel and cigarette smuggling), something that requires resolve and political will to clash with oligarchic interests. 3. Regarding the starting capital of the public intermediary organization and the cost of the establishment of a public development bank as well as of special-purpose banks, totaling €3 billion, we will finance it from the so-called «comfort pillow» of the, around, €11 billion of the Hellenic Financial Stability Fund intended for the banking system. 4. Regarding the total cost of the plan to regain employment: it amounts to €5 billion, €3 billion of which is the cost in the first implementation year. During that first year, the cost will be financed through: €1 billion from the National Strategic Reference Framework 2007-2013 «bridge projects»; €1,5 billion from its 2014-2020 equivalent, and €500 million from other specialized European instruments for employment. In addition, considering the huge effort that will be required to restore pensions, our government, instead of selling-out public property, it will transfer a part of it to social security funds. That is the minimum of measures to be taken in order to reverse the catastrophic consequences of the Private Sector Involvement (PSI) on the pension funds and individual bondholders and gradually restore pensions.